Main features: lock the windows screen, icons, gadgets, hide visible windows, and taskbar. Password: allows You to add secret password to unlock screen so nobody but You may unlock the screen. Automation: allow the program to run automatically at the startup, automatically lock screen when computer idle for certain minutes, also automatic lock on resume and restart. Hotkeys: provide shortcut combination to auto lock, desktop blackout, and open settings interface. Logging: log programs and related events. Different lock screen styles are available, this is what I like. You can also use custom image for your screen lock interface. Obviously, this small application offers more than the windows default lock screen. The ScreenBlur is FREE and developed by InDeepSoftware, please visit his site and get the file. Once you've downloaded the file, extract it to some safe folder as then the program will run as portable application. 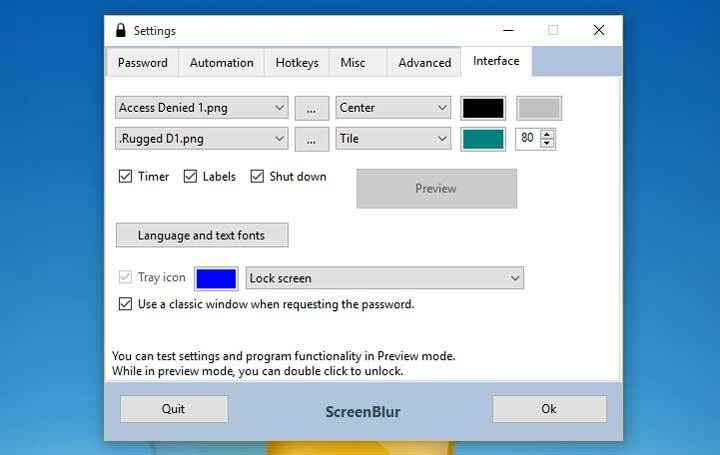 Open "Screenblur.exe", the about/ credit window will appear, press OK to continue to the program setting. Fill in the password if and set other options to your preferences. Now, you have the cool screen lock on your computer. Will all of its feature, its simplicity, small size, and compatibility to almost all Windows version, this application become my favorit screen locker. What about You?